For this rebranding project, I chose a brand for investigation and further development. CBGB was the brand I chose which stands for “Country Bluegrass Blue.” It was the birthplace of American punk rock. I needed to create a new visual system including the possibilities of development of a brand extension for new CBGB. Based on the history of CBGB, I wrote a new mission statement: support creative people, promote original art, and inspire wonder. To extend the brand, I created an art gallery, art work-shops, and an annual art & music festival. I chose orange as the main color because it has the positive attributes of youth, energy, and happiness. The display typeface, also the logo typeface, I chose is “Knockout”. It is unique in that it contains nine different widths and has 32 styles. I decided to choose three fonts from “Knockout” and combined each of them to present a highly recognizable and interesting display typeface for new CBGB. 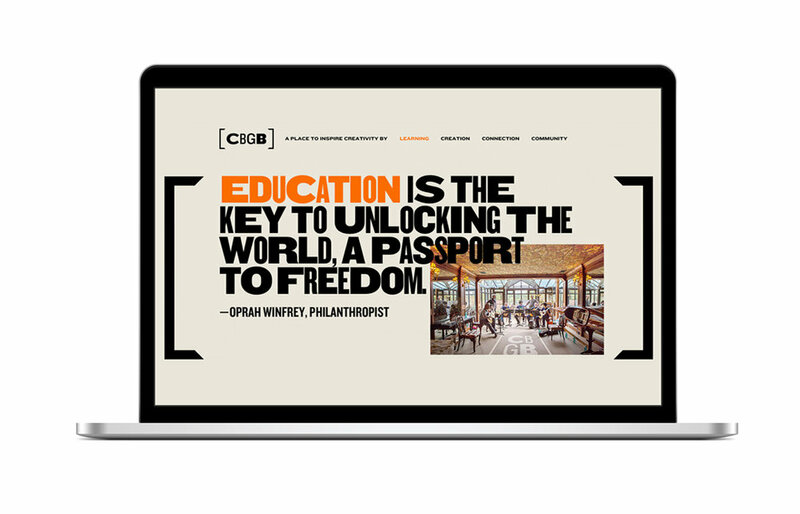 The new logo intends to show that CBGB is a place for everyone to come and have fun and also be creative.